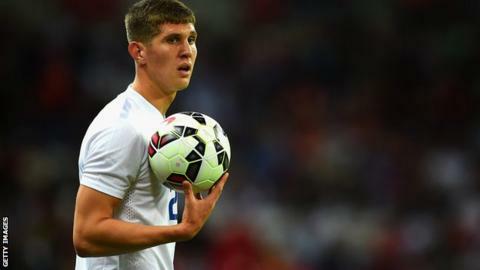 Defender John Stones will miss England's final two Euro 2016 qualifiers against Estonia and Lithuania with a knee injury. The 21-year-old Everton centre-back sat out Sunday's 1-1 Premier League draw with Liverpool at Goodison Park. England manager Roy Hodgson has brought in Tottenham's Andros Townsend and Kyle Walker as cover. England, who have already qualified, face Estonia at Wembley on Friday and Lithuania in Vilnius on Monday. There are also doubts over the fitness of captain Wayne Rooney, Liverpool striker Danny Ings, who has been called up for the first time, and Swansea midfielder Jonjo Shelvey. All three players missed training at St George's Park on Tuesday. Spurs midfielder Townsend, 24, last featured against Slovenia in June, while full-back Walker, 25, won his 11th cap in the friendly draw in Italy in March. England have secured top spot in Group E with eight wins from eight games. Next year's tournament will be held in France.